You are hereSo where is the HOC merchandise? Submitted by Coxxorz on August 16, 2007 - 11:40pm. Is that the biggest mug they have? Submitted by Blackwalt on August 17, 2007 - 1:29pm. Submitted by Coxxorz on August 17, 2007 - 5:19pm. Submitted by Stormblade on August 18, 2007 - 8:24am. 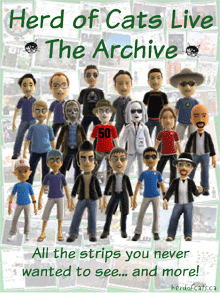 Submitted by Snuffy D on August 17, 2007 - 9:23pm. I want to buy it, and I know it SEZ microwave safe, but I want someone ELSE to test it first. So.. testies, testies, 1,2,3 - who's buying it first - won't be me. Submitted by Coxxorz on August 17, 2007 - 10:41pm. You mean the Stein? I wouldn't put that thing in a microwave unless you're tired of your house... did you notice the big metallic ring around the rim? Submitted by Blackwalt on August 16, 2007 - 5:47pm. 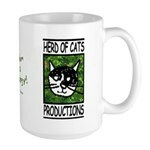 FYI, almost all of the CafePress merchandise comes with a HOCP logo on it. 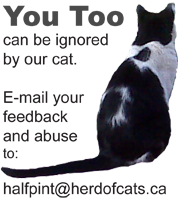 However, as a trademark logo, not as the primary art. Submitted by Coxxorz on August 18, 2007 - 3:12pm. Submitted by Stray Cat on August 18, 2007 - 8:35pm. But it looks like they only do the front logo. 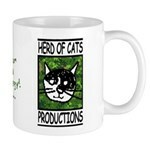 Ideally I would like the cat face on the front and Herd of Cats Productions written on the Back or side. Beige or black or CAMO!!! Submitted by Coxxorz on August 19, 2007 - 12:36am. Well, I added the khaki one. The only other options are White and Black, which are not optimal. The black one has the design printed on an oval(!) 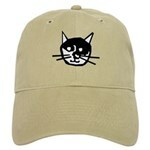 which is stitched onto the cap. Submitted by Blackwalt on August 19, 2007 - 12:08pm. No HoC or Productions text or box. 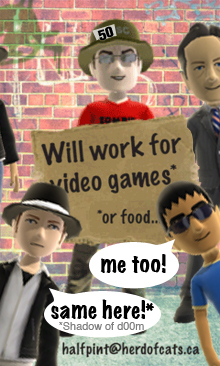 Submitted by Coxxorz on August 19, 2007 - 2:59pm.